New to our store is the Sunbeam TrashRac trash disposal system. This system is unique because it hangs on the inside of your cabinet door and is just the right size for kitchens and bathrooms with limited space on the floor. There are two sizes: 3 gallon and 5 gallon. The 5 gallon capacity size is typically recommended for kitchens, whereas the 3 gallon size is more common for the bathroom. Sunbeam’s TrashRac system is easy to mount; simply screw the framework to the inside of any wooden cabinet door and you are all set! Bags then slip over the top of the frame and are held in place on the sides. The lid closes to trap odors so that they don’t escape into the room. It’s a convenient and functional alternative to trash cans that sit on the floor or take up large amounts of space inside your cabinets! 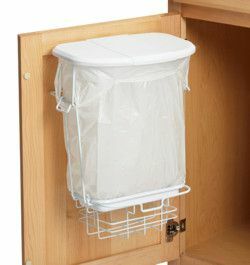 What we love about this trash system: (1) When the cabinet door is opened, the trash can swings out from underneath the countertop, making it easy to scrape dishes and drop trash right inside. (2) The attached (flip-back) lid closes down on top of the wire framework to lock in bad odors from food scraps, meat juices, and other kitchen messes. (3) The trash system makes it’s own refill bags, but plastic grocery bags fit beautifully on these wire frames, so you finally have a use for all of those plastic bags that we accumulate! (4) The bottom tray supports the weight of the contents and acts as a drip tray for juices or liquids that might escape grocery bags that have been re-purposed. This type of system is not always the best option for those with large amounts of trash because the bag size is limited to 5 gallons, whereas typically stand alone kitchen trash cans will often hold about 10-12 gallons. However, for those with smaller kitchens or bathrooms where floor space is limited, the Sunbeam TrashRac system can be the solution that you have been looking for!